Not able to install an air conditioner into your wall or window? No sweat (literally). These portable ACs will totally do the trick to keep things cool almost anywhere. This may slightly vary based on living conditions. If your room(s) has higher ceilings, lots of windows, direct sunlight, or insulation that isn’t that great you may need higher BTUs even if you square footage is on the smaller side. If that’s the case, add another 2,000 BTUs and that’ll help you figure out which unit is really best for your actual situation. Check out some of the best portable air conditioners (so far) in 2019. 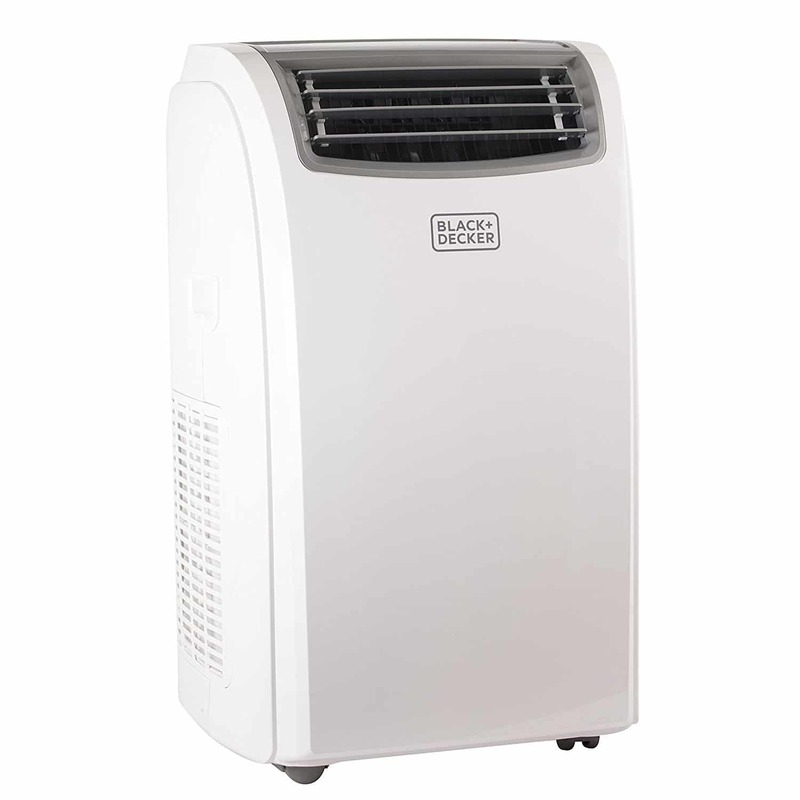 This best-selling portable air conditioner from Black + Decker has a powerful vertical air flow that will cool down a room anywhere between 500 and 550 square feet. Perfect for a bedroom, larger living room or even kids play room. We also loved how the filter is super easy to slide right out so you can quickly rinse it under your water faucet to help ensure the air is as clean as can be. Enjoy the 24-hour on or off timer and even sleep mode so it doesn’t run all night if you don’t want it to. Plus, the LED digital display makes it super easy to use and program. Learn more here! This is the mother of all portable air conditioners (14,000 BTUs)! It currently has 4 out of 5 stars on Amazon and over 1,800 reviews. You have three choices when it comes to this AC. You can use it as a traditional air conditioner, a dehumidifier (score! ), or just a plain old fan. This one will cover larger rooms (up to 700 square feet) and can cool down as low as 61 degrees (or as warm as 89 degrees). Plus, there’s a 24-hour programmable timer option so you can set it in the morning before you leave for work and have it turn on before you get home so you walk into a nice and cool room. We also loved the remote control that came with it so we didn’t have to get up off the couch every time we wanted to adjust the temp (yes, we’re lazy and totally ok with that). It also includes the extendable exhaust, hose, and required window kit so you’re really good to go. This Whynter is currently the best selling portable AC on Amazon right now! Learn more here! It’s one of the highest rated options on Amazon right now with a pretty incredible 4.5 out of 5 stars and over 100 customer reviews, with 88% of those reviewers giving it either 4 or 5 stars! Outside of being able to quickly cool down a variety of different sized rooms, it’s also super energy efficient, can be controlled and programmed via a remote control, and is one of the quietest options on the market right now. Even better, the dual filtration systems helps to remove and reduce impurities in the air, so it’s a great option for allergy sufferers like us. Learn more here! We love this portable AC because it’s super cheap in price, but doesn’t compromise quality and function. It’s perfect for cooling down a regular sized room (around 161 square feet) so it’s ideal for a bedroom, home office, or smaller living room. Plus, it’s on wheels so you can move this thing around a bit (bring it closer to you if needed or just move it farther away). This one was pretty easy to install thanks to the included window kit (and it’ll work through almost any vertical or horizontal window unit). Program this home AC with the remote control and choose from the AC, fan, or even dehumidifier. Learn more here! Keep larger spaces cool with this 10,000 BTU portable AC. It’ll cover you up to around 450 sq. feet. We loved that it has no bucket and no-drip design features and uses an auto-evaporation system. This means say ‘goodbye’ to having to drain the water or empty the bucket. Yes, this alone for us should give it 1,000 stars! Its wheels will allow you to easily move this AC around to the different rooms that need it. It has a cool futuristic look thanks to the sleek AF black exterior and digital LCD display and control panel. Plus, it comes with a remote so control this cooling beast from your bed or couch! Learn more here! Yes this is the portable home AC of the future! It legit looks like a cool wireless speaker (it’s not!) and works like a charm. This smart portable air conditioner from Frigidaire is 100% Wi-Fi ready and can be controlled and programmed via the app on your smartphone. It also packs a powerful punch since the 12,000 BTUs will cool a room/space up to 550 square feet! Thanks to the 360-degree designed airflow, it’ll push the air up and around in a spiral motion to help make sure you’re not getting any hot spots in your room. We loved the way you could schedule your AC to go on and off based on themes, like weekends, night, weekdays, etc. It’s pretty much like a set it and forget it option! Learn more here! We classify this one as one better looking portable ACs on the market right now. It’ll help cool off a large sized room that’s around 400 square feet, so it’s also perfect for a small New York City apartment! Plus, it’s on wheels so it’s pretty easy to move around your place. We also love that is comes with a remote control so you don’t even have to get off the couch to change the temperature if you don’t want. You can also program this air conditioner up to 24-hours so have it cooling off your place before you even get home or have it shut off automatically in the early morning if you choose to. Learn more here! Coffee For One? Check Out These Top Rated Coffee Machine Brands!